When I checked out of the motel this morning, I asked the girl at the desk, if Acadia National Park was worth a ride in the pouring rain. She hesitated for only a moment and pointed out that I was going to be riding in the rain anyway. “It’s really beautiful,” she said. I decided to go ahead with it, and turned south in the rain and traffic toward the park. It was definitely a misfire. 65 extra miles of heavy rain and dense fog. I couldn’t see anything but the taillights of the car in front of me, and the occasional tree on the side of the road. The occasional tree indicated that what I was not seeing was extremely beautiful, but it was shrouded in fog. The 65 miles represents nearly three hours, and by then, I was back to where I started on highway 1. We said our goodbyes, I rode the amazing bridge across the Penobscot Narrows, and veered left at the entrance to Fort Knox. Too much time lost already, and rain too heavy to stop and pretend that any experience today would live up to what it surely would be in dryer conditions. I made another stop in Brunswick, just before I took the 4-lane, got fuel, warmed up, and changed clothes. I was wet to the skin by then from rain wicking down from my collar. I put on all the dry shirts I had left, and set out for the final leg of the trip. Once I hit the 4 lane, I booked it down to the New Hampshire line and stopped to warm up just when the toll road ended, just before entering New Hampshire. The entirety of those 70 miles was in thick traffic with trucks who threw their spray on me. The lanes were shifted so that the left lane was closed, and the shoulder was being used as a lane. The surface was removed for re-paving, so what was left, was grooved and bumpy. When I left the gas station, I missed a turn and started back North on 95 and did another 10 extra miles and barely avoided having to pay toll twice more to get headed back in the right direction. Finally back on I-95 South, I entered NH, and paid another 75 cents exiting to hwy 101. I found the next road easily, but turned the wrong way and drove exactly 6 miles north when I should have been headed south. Back to where I started I had a short jaunt of 8 miles to my place of rest, but alas, I got lost and those 8 miles took me 2 hours. I arrived safe, but frustrated, dizzy from turning the bike around and shivered through. This was a frustrating day. It is quite frustrating to stop the bike at a toll booth in the pouring rain, remove soaked gloves, dig through my inner jacket liner for my wallet, replace said wallet, re-zip and fasten 3 layers, and finally, to unsuccessfully attempt to put wet gloves back onto wet hands. All with a line of impatient drivers behind. All four times I paid toll, I had to pull off the Interstate beyond the toll booths and get dressed again before going on. Slightly wetter and slightly colder than before. Actually, the same thing happened in Saint John, New Brunswick and I had to exit to get dressed. After exiting, I returned to the highway headed in the wrong direction and nearly had to pay toll 2 more times to head east again. Tonight, I’ve finally found the dry, warm home of my former student, Aubrey, who with her parents has offered to keep for the night. We’ve had a nice long visit, and I’m basking in the kindness of friends, known and unknown. Many times after last year’s trip, I mentioned that there were several times when I realized that I hadn’t spoken to anyone all day, or for several days even. I could go through stretches where I was only near people at gas stops, and then, use a card at the pump and keep moving silently. That was a trip about solitude. Whatever I thought this trip was going to be about, it has been a trip about people. I have learned that though I may find myself in desperate need of alone time, I can’t possibly live without people. I have depended on the kindness of Allison’s Aunt Brenda and Uncle Joe, a former student and her father (for 2 night’s lodging and a day of wonderful entertainment), a dear old friend and his lovely wife and kids, and now another former student, Aubs and her parents. Who knows whom else I may find myself grateful for during the rest of this trip? I’m actually finding myself shifting the mindset from getting away, to looking up folks to drop in on. I’m even seeing the folks that work at the State and Provincial Park campgrounds as people I’ve depended on, rather than people simply carrying out their duties. I’m made to think about my ramblings about the disciples going out depending on the hospitality of others – about them providing a means for others to serve, to take part in the Kingdom of God. Take nothing but the clothes on your back. Last year’s trip was for the most part, about the riding. Riding through gorgeous, exotic landscapes, and American, or even pre-american subcultures. 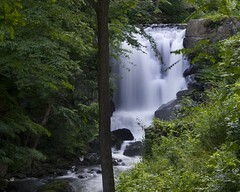 I saw some very cool places, but they were usually on my way, and considered part of the ride. The destinations weren’t destinations at all, but merely randomly chosen places to stop and rest that represented roughly, about as far as a guy can comfortably ride on a good day. I had lots of good days. And when I didn’t, I could always pull up short, because the destinations weren’t the point in any way other than it represented a bar line in a measured distance that told me I was headed toward home and that I would get there when I was supposed to be there. In that way, if I fell short on a given day, I would have to make it up, because the final resting place WAS important, but the points along the way were simply to be enjoyed for what they were. After falling behind, I didn’t have to make up the distance all in one day, I could spread it out over several, thereby, proving that no point of destination was anymore important than the one I’d fell short of. This year, the biggest part of my trip has been about making pre-chosen destinations where I can get warm and dry. And often, these destinations represent people who have offered to take care of me, dry my clothes and provide a warm shower and a bed. The soaked, cold riding has served to get me there, and has been what I’ve had to recover from. Quite the opposite experience, this ride. A complete shift of focus. Honestly, it’s a challenge to my personality – a short in my wiring. A guy can ride off on his own, all confident and brave, but he can never survive alone. Even if he doesn’t realize his company. And the angels attended him. I rode today without a destination, but only a direction. I felt it was time to come back to the states. I thought I’d hit Maine and stop. But, though it felt like I’d ridden for a long, long time, when I reached the US/Canada border, it was only 3:00pm. That’s 2:00 eastern time, and so I kept riding. 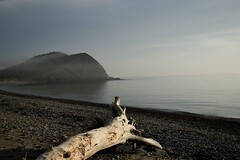 The day started out drizzly and with heavy fog as I rode along Fundy Bay toward Parrsboro. Once I turned North and made my way inland a bit, the fog lifted and the day was nice. By the time I reached Moncton, the sky once again became foreboding, and I rode in and out of rain for the next 150 miles. When I reached Saint John, the temperature had dropped considerably, and continued to get colder and wetter the closer I got to Maine. In all, there was about a 20 degree difference between Nova Scotia and Maine. Every time I passed a Mom and Pop Motel along Coastal Hwy 1, I thought of stopping for the night, but I thought of the probable price of these little motels along the coast in tourist land, and realized it was still somewhat early, and so I rode on. The rain makes a luggage-laden bike more conspicuous, so I responded to queries and participated in conversations each time I stopped. Really unconcerned with how far I got today, and more or less numbed by the weather, I took every long cut off highway one that dipped down into villages and coastal towns. Eventually, I began to see signs for Bar Harbor and Acadia Park, and knowing there was campground near Bar Harbor, decided to make that my goal. When I arrived in Ellsworth, it raining pretty hard again, so I turned down Rt 3 toward Bar Harbor, ready to find some shelter. Almost immediately, I saw another Mom and Pop motel, and this time decided to take the chance and inquire as to price. When I pulled into the parking lot, I noticed the price on a sign. It was less expensive than the campsites at some of the tourist destinations, and actually had showers in the rooms! Now I’m no novice traveling fool, I know that the chances of a room actually being the price quoted on the sign is next to nil, so I was sure to quote that price when I asked if they had any available. The price was exactly what I asked, including, tax and everything. So I’ve spread all my gear around to dry, and am lying on my back listening to the rain out the window contemplating tomorrow’s weather. The weather is supposed to get worse tomorrow. I’m going to continue down the Coastal 1, and deal with it. I arrived at my destination at about 6 pm. I was told by a police woman at my last fuel stop that there were a few really nice restaurants down the “mountain” from my campsite, so when I got here, I went into town to scope out the environment before I set up camp. Aha! I found Mo’s Café in “downtown 5 Islands,” so after I set up camp, I set off for a bite and some internet. I unloaded my bike when I set up camp, and showed up at Mo’s without my computer charger. I texted Allison via the internet, and posted a couple of yesterday’s photos before my battery went dead and packed up my tank bag to leave. When I bussed my table and went inside the café, the music was beginning. I couldn’t leave. My friend, Beth, an avid Celtic music fan and gifted musician, upon hearing I was headed to Cape Breton implored me to find some music. I thought that might be nearly impossible on a bike, camping, in this weather. But it looked like it was to come to pass. There was a husband/wife duo just starting. Lots of folks were milling around, and everyone was interested in everyone else. Conversation was easy, and the music was so good that conversation waned and listening commenced. I learned that this café had just opened last week. It is owned by a man from California (sitting in the corner) who had bought one of the 5 islands on a whim, site unseen, and after coming to see his purchase, had also bought and renovated this building and opened this amazing café. This was the second night of music he’d had. As I listened to the music and watched two little toddlers constantly getting into trouble, I shed a tear, and then another, and soon they wouldn’t stop. The music was amazing. It ripped straight through to the soul and touched the deep places. I stood against a beam and sipped several cups of coffee, and quietly listened. My iPod hasn’t been turned on, or even taken out of the bag during the whole trip. There is always music playing in my head, and I’ve heard some fairly melodic feathered friends’ serenades, but tonight is the only music I’ve heard outside of Jim’s and Catherine’s living room since I drifted off to the strains of Federico Moreno Torroba under the stars in Ithaca. I stand there thinking about a time when real live people presented the only music available, and marveled at the community made easy by these deep songs sung from deep places. I hope I happen upon more people sharing their songs before I make it home again. When the sun started setting, I realized it was time to make it back to camp, and so I rode up the “mountain,” started a fire and settled into a mood of gratitude. Today was a good day. I can almost say, it was my first day in 13 without rain, but alas, I got rained on a little bit, so make that 13 days with rain. But this was not like the other rain days. This rain was just intermittent when the clouds became too thick to contain themselves. Then I would ride out of it, into lighter clouds. The sky is cloudy tonight, but oddly enough, the baby moon is shining hazily through a foggy break in the clouds. It is 10:46 pm, and the sunset colors have not completely faded. That is strange for me. Sunset colors at nearly 11:00pm? This morning, I couldn’t bear to ride back from Cape Breton Island exactly the way I’d come, so I headed east to Sydney, and rode west from there along the other side of Bras d’Or. Once I reached the Canso Causeway, I had no choice but to backtrack, but only for about 50 miles. 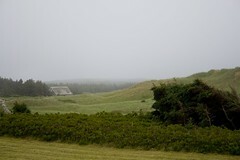 The last 50 miles of the day were along, and in sight of, the Bay of Fundy, to this Provincial Park. The ride was a good mixture of back roads and highway to make up time, so I arrived in early evening and had time to think, have some coffee, and listen to music. So, at this moment, I’m sitting by my fire, watching the lingering sunset colors, and the moon, reluctant to set, reflecting in the Bay Fundy. I think it was the rain that caused it, but nevertheless, when I entered Canada, I felt extremely lonely. As if I had left everything that belonged to me, and everything to which I belonged. The money was odd – I couldn’t get used to dollar coins and two dollar coins. Gas is sold in litres and costs almost twice as much as it does at home. I gassed up just before I crossed the border, but of course I only carry 4 gallons. At highway speeds, in the rain and extreme Bay of Fundy winds, I got poor mileage, and went on reserve at only 120 miles. I stopped to get gas, and my credit card was declined. I had been waiting for that, since I’d been zipping across the country and using the card every 100 miles. But it was a blow to have it happen first thing when I came into Canada in the cold rain. I used my backup card, and though I only got 3 gallons, and the pump charged me twelve dollars and some odd cents, the credit card was charged $88. I stopped sooner next time, worried about running out of gas, and got another 2 gallons. This time, the credit card was charged $115, and Allison got an alert that a hold had been put on that card as well. Fortunately, I’d stopped at an ATM and got some Canadian cash. I called the card company next day, but they certainly did nothing to ease my mind. They did, however, remove the hold. The very next time I used the card, they called Allison again. I sure do appreciate how alert they are to irregular purchases and locations, but having a credit card does me no good if I can’t use it. Anyway, this was my welcome to Canada. Tonight though, when I arrived back at my campsite cold and wet, and built a fire, and watched the clouds and fog clear out, exposing myriad stars, the milkyway, and the brand new crescent moon, I finally felt at home. This is the same sky I have at home. This is a sky I share with the people on Cape Breton, Nova Scotia. This is the same sky I sat under in New Mexico, and Wyoming, and California last summer. Today, once again, I when I looked at the time, and realized that the miles traveled didn’t match, I was thinking of the difference in the perception of time when riding. On the bike, time doesn’t pass. That is, the perception of time doesn’t register. I feel the passage of miles, but am completely unaware of the passage of time. I was thinking today, as I rode, completely unaware of what the clock might say, that is not time passed that matters – it is time spent that counts. I’ve always been perplexed by the term “pastime.” As if we had nothing to do and were looking for something to pass the time. That is a foreign concept to me. Time passes in busyness, and I wonder where it went. I can’t remember ever wondering what to do with my time. Leisure is not a luxury, but a decision, a discipline – a sacrifice even. I sacrifice, my family sacrifices. But it’s something that needs to be done. Time spent in Sabbath. Time spent in intentional space. Time spent beneath the milky way, far from the lights of industry, of busyness, of day-to-day. And so, tonight, I sit beneath that hazy swath of light, stretching across the darkest sky, and realize that this is not a familiar sight to the busy person. This is not something that a healthy, wealthy and wise person can experience. Perhaps we’ve mis-defined healthy, wealthy and wise. Early to bed and early to rise. Space is healthy. The Milkyway is healthy. There is nothing more healthy than an easy soul, and that is accomplished only in Sabbath. -withdrawal from the day to day. Today may have very well been the first day that my soul became easy. I’ve had a wonderful time visiting while hiding from the rain. I’ve felt loved and accepted, but I’ve been stressed about the unrelenting weather, even when shielded from it. Today, though, I rode off into a clear morning along an extremely gorgeous scenic route. About 50 miles in, I entered the Cape Breton Highlands National Park. I took a scenic detour at the northernmost point in the park and dealt with heavy rain for about half an hour. During the rain, I missed a poorly marked turn and followed a back road toward Bay St. Lawrence. I realized I was on the wrong road about 5 miles in, but it was so beautiful that I couldn’t bring myself to turn around. Eventually, remembering that I wanted to catch a boat for whale watching, I turned around in the rain and headed back south to make the turn I’d missed earlier. There was road construction all along the way, and all the flagmen smiled knowingly at me as I passed on my way back to the right road. When I arrived at Lake Pleasant Harbor, just as the rain subsided, I was told by Captain Mark’s crew, that the whale trip was iffy. There were no other passengers booked for the ride. They postponed the departure by 30 minutes and eventually closed shop and went home. The competition next door had gone many miles further out to sea because of the heavy fog, and were late by 2 hours and a half. I waited, however, and had a lobster roll and got on the boat at about the time I’d planned to be back to my campsite. The wait was well worth it. We immediately came upon dozens of Pilot Whales and spent the next hour watching them surface, arch, blow and swim alongside and under the boat. During the last darkening hour before I reached my camp again, I road through swarms of bugs that completely blackened my face shield and blotted out my headlamp. The roads were wet, but I’d come through just as the storms subsided. I reached camp beneath a clearing sky, and now as I sit beside the fire, the milkyway stretches brightly overhead. 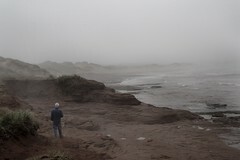 I left PEI this morning at about 11:00 in very heavy fog. I arrived at my campsite at about 7, under momentarily clearing skies. It’s 10:00pm now and the sun as finally ceased to show its colors on the clouds over the hills. Once I experienced the “four-lane” again, 55 miles from Summerside, I realized I wanted to find a back way until the “four-lane” disappeared. I took NS hwy 6 all the way to New Glasgow. It was about 90 miles, all in driving, beating rain. Just as I entered New Glasgow, the rain stopped, the road was dry, and the temperature was 10 degrees warmer. I stopped at a Tim Horton’s to stretch my legs and struck up a conversation with a guy at a picnic table beside his Goldwing. He was a talker, he was, eh? We talked for a long time about bike trips, pretty places, rain, hills, and National Parks. Back on the road, I made it 1 mile before a detour took me back through the country again, and into the rain. The rest of the trip was intermittent with the showers, and I arrived with only residual soak. That 90 miles presented the hardest rain I’ve experienced so far. Actually it was the first “cloud shower” (as they call them here). For a week I’ve been riding through this gargantuan weather system that just pours a consistent rain on all the earth. Today, I rode through a little of that, but mostly just thunder storms that popped up and went away. But when they popped up they obscured the road, soaked me all the way through, and chilled me. I stopped in Baddeck, the last town before my campsite, to gas up and get a snack before settling in. 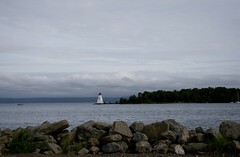 Baddeck sits on the water and has a charm between small town and tourist destination. Perhaps tourists are recognized and accommodated, but not pampered or catered to. I enjoyed passing through here. Tonight I’m sitting by a fire beside the Great Bras d’Or, hoping that the rain holds off tonight and tomorrow. As I settled into the campground at sunset, the clouds broke a bit and beautiful colors and formations occurred over the mountains behind my campsite. I’m tucked down into between high hills on either side facing the ocean water that flows between and splits the island with the Bras d’Or. Tomorrow, I plan to ride the 186 miles of the Cabot Trail around Cape Breton Island, and through the Highlands National Park. Tomorrow’s riding will be solely for sightseeing, and I will arrive right back here where I started, beside the Bras, d’Or, lighting a fire if it is not raining, and lying on my back thinking if it is. Today, Jim and I went to a restaurant owned and operated by a lady from Texas and her British husband. The restaurant was quite a way out in the country. When we walked in, the proprietor said, “Hi Jim! Be right with you.” And, “oh! And YOU rode all the way from South Carolina on your motorcycle!!! !” I had a vision of the old movies when the whole town knew when a visitor was coming and everyone was excited. I felt like the talk of the island. In the evening, Catherine prepared a feast for dinner. After Jim’s kids were sort of put to bed, he broke out the guitars and played a suite he’d written, and sundry other items. When Catherine came downstairs, they sang and played for me, and we exchanged songs, and solos. It was a wonderful evening. It was wonderful to actually spend some time with Jim and Catherine together. What a wonderful woman Jim is blessed with. And put a song in her mouth and you find even more of her. Though we’d never met, I felt as if I knew Catherine from Facebook. I was not wrong, but she is more wonderful than I’d imagined. Good job Jim. You’re a blessed man. What a fun day! Jim took me sightseeing on the island. His son, Leam, accompanied/entertained us. When we got home, I decided to spend another night there because I couldn’t make it to Cape Breton before dark. Jim and Catherine had a rehearsal to go to, so I stayed home and tried to figure out where to go next. I realized some things about myself tonight, and tweaked my plans accordingly. Jim and Catherine came home while I was editing and uploading the pics of the day, so we gathered in the living room for some viewing and more wonderful visiting. We were up quite late, though my eyes popped open early just as if I’d gotten plenty of sleep.